Something I’ve always had to struggle with is the annoying noise caused by electrical interferences. Whether it’s a constant low-tone hum or a high-pitched buzz, I rarely had a completely black background in my audio equipment and I’m sure I am not the only one. Finding the cause is often far from easy, so the other option is to fix the symptoms. Thr iFi Ear Buddy is a nifty device which you can plug your headphones in and its aim is to remove background noise and to make it possible to recover the “lost bits” when using digital volume adjustment. Disclaimer: I would like to thank Hoomairah at iFi Audio for allowing me to keep this review unit. Official specifications for the device are available on iFi’s website. 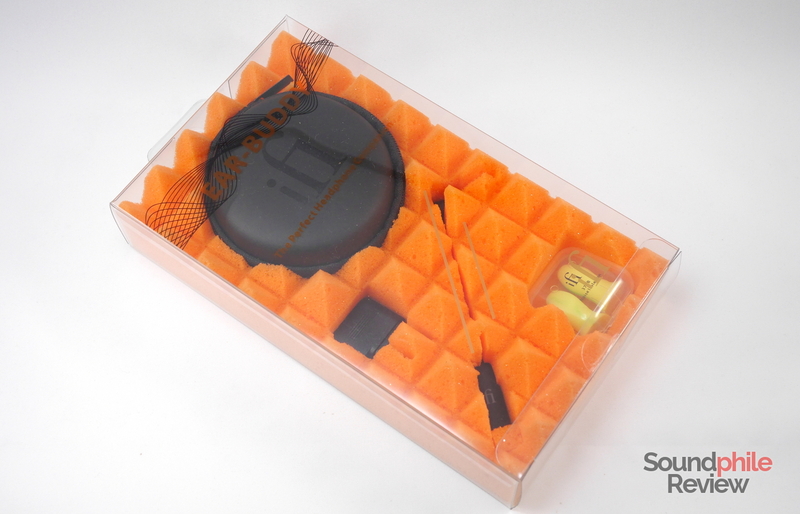 The transparent plastic box the iFi Ear Buddy comes in does not contain just the device. 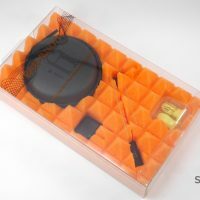 In fact it’s a rather large box (something the environmentalists among us may rightly think as useless) which also holds an airplane adapter, a pair of ear plugs and a hard carrying case for earphones. All in all it’s a rather large set of items and it helps justifying the price for the iFi Ear Buddy. 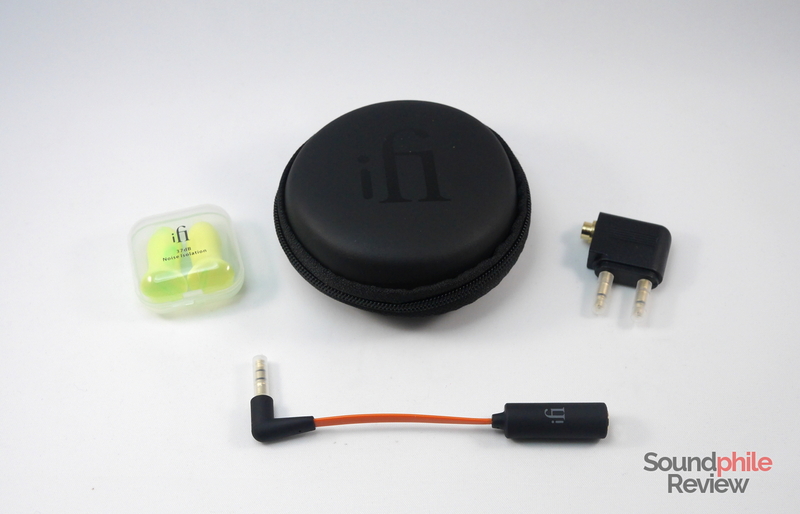 The carrying case is cheap and just barely acceptable, despite the “iFi” logo on it; the ear plugs offer 37 dB noise isolation and I can attest they work wonderfully. They helped me go through a couple days when I had a strong headache caused by sounds – I could appreciate the calm of silence even though I had people listening to music at high volume in the next room. 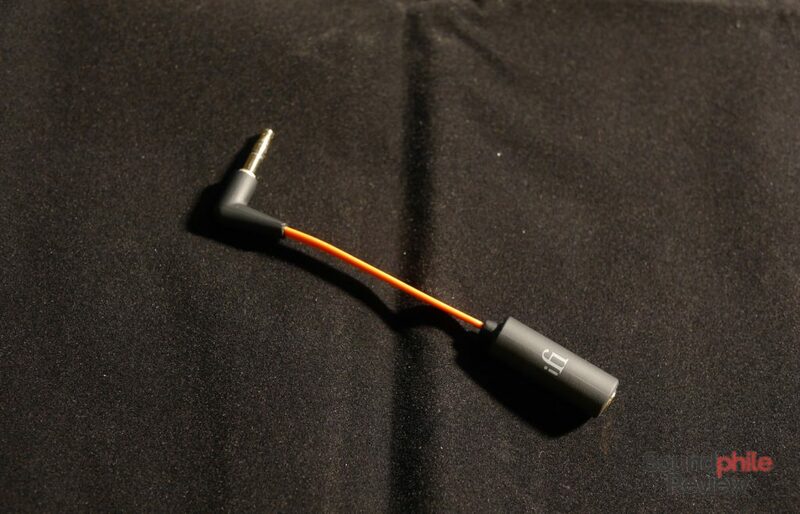 The iFi Ear Buddy looks like a patch with a right angle male 3.5 mm jack on one side and a (rather large) female 3.5 mm connector on the other. Between the two stands an orange, flat cable covered in rubber. Both connectors are made of plastic and they are covered in soft-touch rubbery finish. Build quality is decent and the device appears to be able to resist a bit of abuse. I think that the flat cable choice is not the best one as it is not as flexible as a standard round cable, and it may cause issues in the long run if using it on the move. 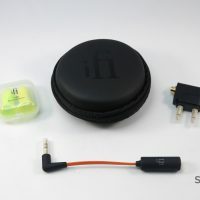 The male 3.5 mm connectors is TRS; I found out the iFi Ear Buddy can also be effectively used as an adapter for headphones using the TRRS jack – a standard not every amplifier plays nicely with (i.e. the Little Dot MKIII SE, or the Head ‘n’ HiFi Objective2). The only downside is the fact that in-line remotes and microphones stop working, so you won’t be able to use them i.e. on a phone. The main task for the iFi Ear Buddy, though, is to “restore the dynamic range lost due to the use of digital volume”. What does that mean? When using digital volume (i.e. adjusting the volume in Windows or macOS), you actually crunch the dynamic range because you use less bits to represent the same information: as the maximum volume is lower, so is the ceiling, so the same information has to fit in a smaller space, hence the dynamic range is reduced. 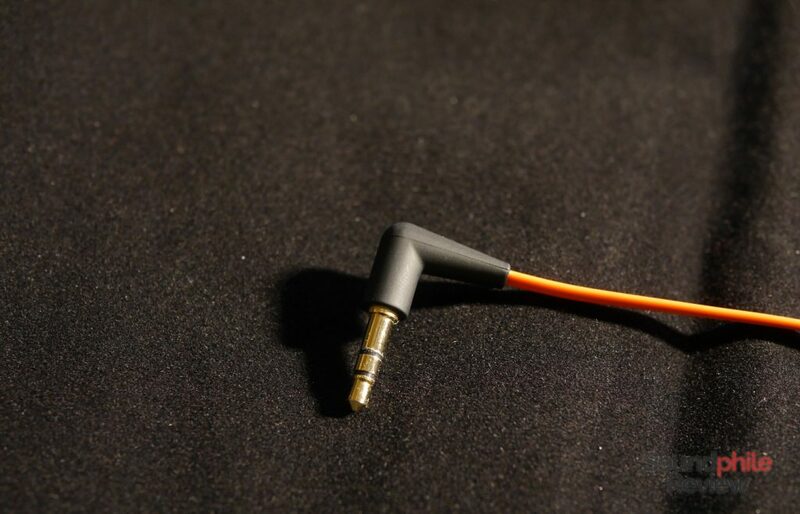 iFi claims the Ear Buddy removes this issue by making the earphones a bit harder to drive and therefore allowing you to use the maximum volume and take advantage of the full dynamic range. There is another side to the story, too: since it makes the headphones harder to drive, it also means you can use amplifiers that output too much power for sensitive earphones and get decent volume. This is in fact the main reason why I have been using the iFi Ear Buddy: it allows me to use the Objective2 amplifier with headphones such as the KZ ZS6 with the volume knob at 8 o’clock – past the channel imbalance zone. The other positive result is the fact that the iFi Ear Buddy removes any hiss or other electrical interference. While it can’t filter out EM interference (i.e. the Topping DX7 is sensitive to cell phones), it is able to remove hisses caused by ground loops or other electrical noises; my power is awfully noisy, but I could eliminate any unwanted noise using the Ear Buddy (as I stated in the iFi micro iCAN SE, too). This is a cheap and effective way to circumvent the problem instead of buying expensive power conditioners – whose effectiveness is also questionable, as far as I know. I could not hear any significant differences in sound when using the Ear Buddy – in a positive way. Most of the times I have been using low-impedance outputs, such as the Aune M1s, but I also used other sources. There were small differences when using amplifiers with high output impedance (i.e. Topping A30). As the iFi Ear Buddy has an output impedance of less than 1.5 Ω, it is enough for any reasonable headphones to keep the 1:8 ratio intact and thus preserve the intended frequency response. It has to be noted that the iFi Ear Buddy is best used when dealing with high-impedance sources, as it otherwise may end up raising the output impedance – something that may be less than ideal with sensitive headphones. I found the iFi Ear Buddy to be extremely useful. I have plenty of headphones with impedance between 16 Ω and 64 Ω, which then need an output impedance below 8 Ω. The problem is a few sources I use – the Topping DX7 and D30, as an example – have a higher impedance and change the headphones’ frequency response. What’s more, there is always electrical noise. The Ear Buddy swiftly solves both problems at once. Now that I tried it, I could not really go back. It is a must-have accessory if you have any of these issues, and taking its low price ($20) into consideration, it deserves every praise and my full recommendation. The iFi Ear Buddy has a suggested retail price of $20. How does this compare to the UE Buffer Jack? Alas I can’t find it on sale in Italy and shipping from US is prohibitive ($70!). I’ll try getting in touch with UE to see if they can point me to a retailer in Europe. 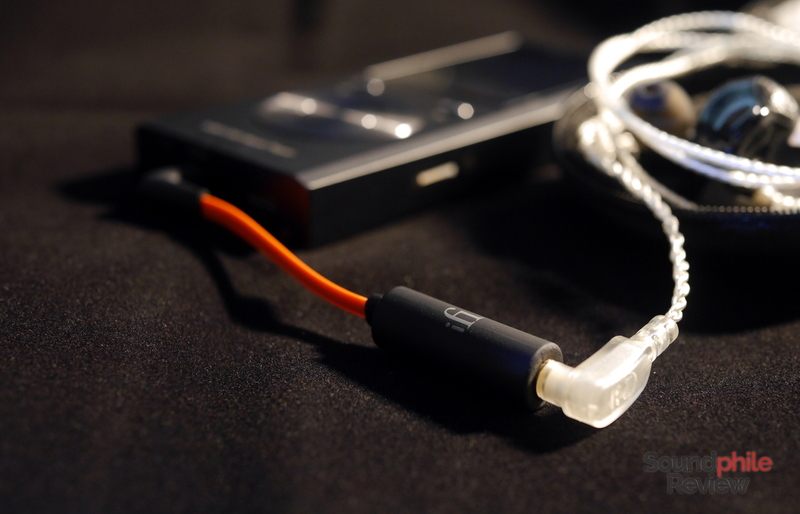 Why can the EarBuddy solve the problem about high output impedance? Doesn’t an attenuator like this item increase output impedance rather than solving the problem? but the article about 1:8 rule describes that an attenuator does not solve the problem. If I misunderstood, could you point out that? You are right: most attenuators have a high impedance output. The point with the iFi Ear Buddy is that it does not – in fact it has such a low impedance (1.5 Ω) that you can use any headphones and stay well above the 1:8 ratio (1.5 Ω * 8 = 12 Ω). That’s why there is a substantial difference with other cheap attenuators. I use a Xiaomi Mi Hybrid Pro HD with my 5T smartphone. Makes sense to buy a EarBuddy for my setup? In my opinion it does not, unless you are experiencing noise (which you shouldn’t).